This week sees a rare event these days… a developer celebrating progress. Anglo-Dutch TCN UK is marking the second anniversary of its 285-acre Waterfront mixed-use development at Manvers, in Rotherham. *Planning permission granted for a new KFC drive-thru restaurant, with construction due to start in March 2009. *Planning permission granted for an Aldi with neighbourhood retail units. *Planning permission for an additional 350 houses and additional retail and leisure facilities. 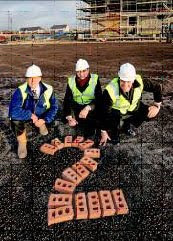 TCN UK also completed a deal this year with the UK’s biggest housebuilder, Taylor Wimpey, for the creation of 334 homes on a 19-acre site at Waterfront. And there is even more to come. Stephen Holme, director of TCN UK, said: “With the leisure and residential elements of the Waterfront scheme reaching completion or well under way, we are now in a strong position to start marketing the office and industrial accommodation. “Planning has been granted for 78,000 sq ft of business premises, and we are able to cater for a range of requirements on a design-and-build basis, up to 100,000 sq ft. Waterfront will be ideal for any business wanting bespoke premises just a seven-minute drive from the M1. Future development plans for the Waterfront also include additional ancillary retail outlets, including a petrol station and medical and health centre.